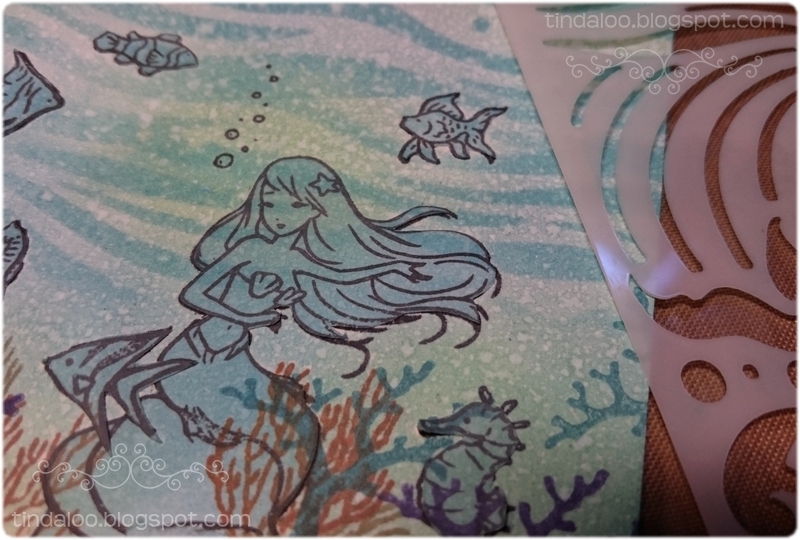 🧜‍♀️ My second card has a fun shaker window, and I colored the mermaid to look like Ariel the little Mermaid from Disney! 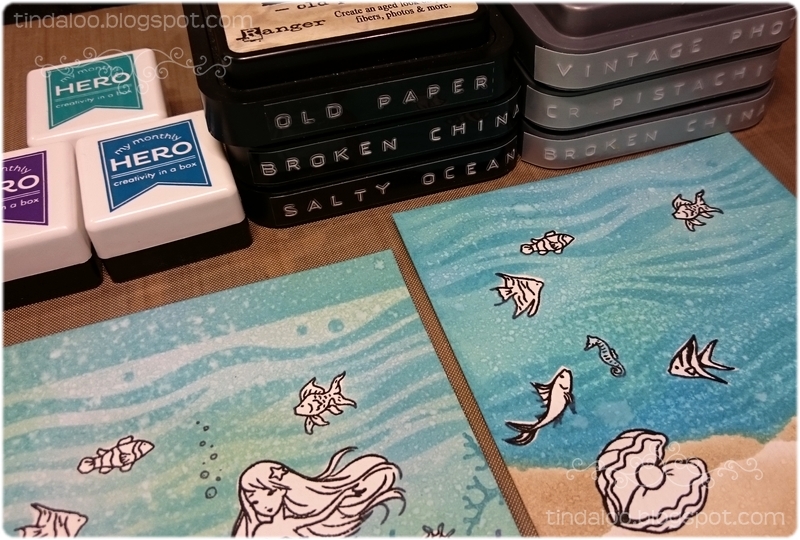 First I stamped several fish and the oyster, and a mermaid on watercolor paper with black archival ink. Then I used post-it notes to mask the stamps, and created the sandy seabed by tearing a piece of paper and using that as a mask. Inking with both regular distress inks and oxides as well as the ink cubes from the Hero Arts kit. The stencil that followed with the kit is just amazing, perfect to make it look like it's underwater, and it helps to splatter some waterdroplets too. 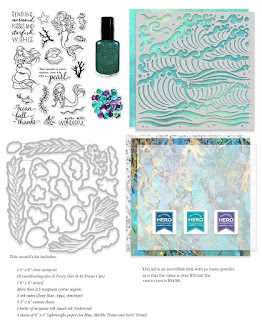 Stamps/Images: Hero Arts MMH May 2017 Mermaid kit clearstamps & co-ordinating dies. 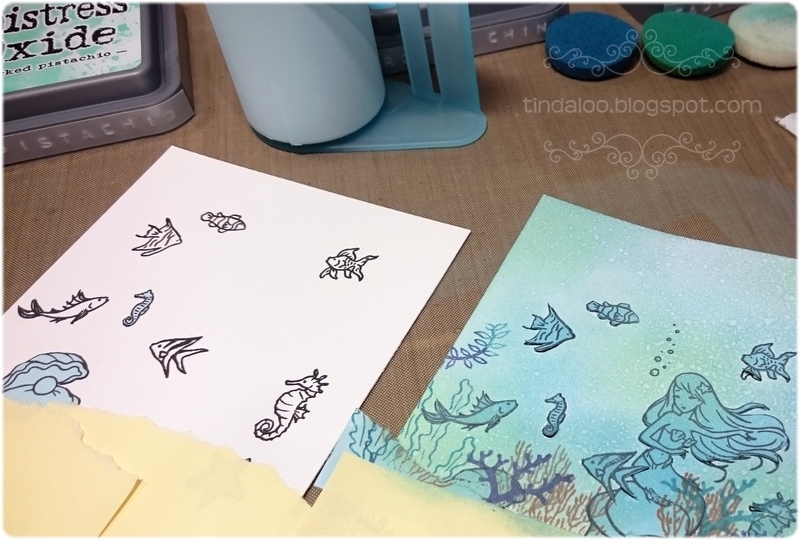 I also used the Hunkydory 'Beautiful Mermaids' clearstamps set (to get some extra fishes and seaweeds). Papers: I prefer Canson Montvale aquarelle paper (200 g/m coldpressed) for my motifs. Bazzill cardstock and Bling cardstock. Plain white cardstock. Misc scrap pieces of designerpapers, vellum. Panduro Hobby 'Circus' 12x12 PP. Embellishments: Multicraft 'Baby' craft medley cup sequins. Pink glitter Washi tape, from Panduro I think. Creative Expressions Self-Adhesive rhinestone gems. 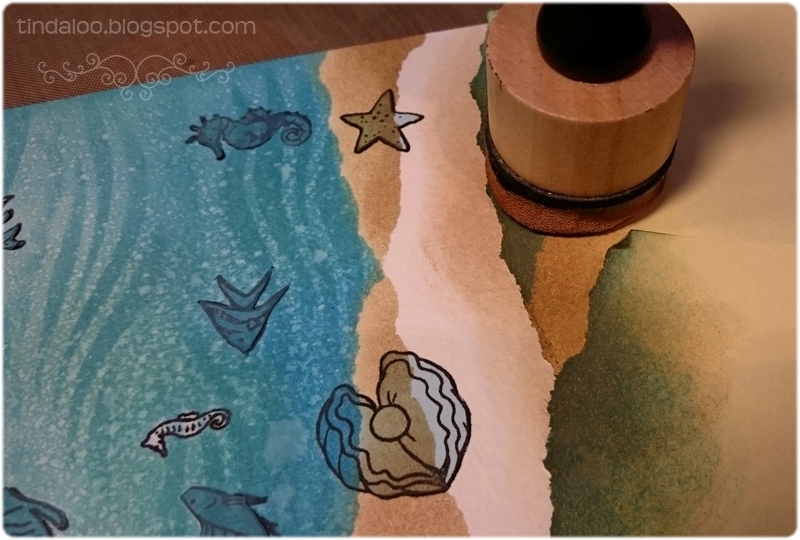 Tools: 'Mermaid waves' Stencil from the HA kit. I always use my Scor-Pal to score n fold my cards. My distress tools from Ranger Ink is always in use ~ Tim Holtz® Mini Ink Round Blending Tool & the Inkssentials Ink Blending Tool and Foams. EK Success® Whale Of A Punch 'Large Circle 1.75'. Martha Stewart 'Flourish Edge Punch'. 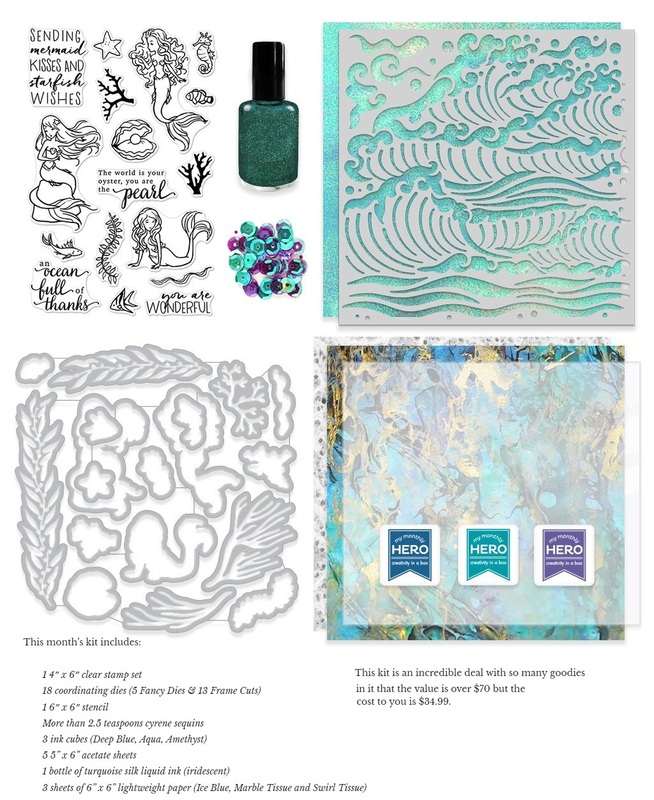 Dies: Hero Arts co-ordinating dies & fancy sea weed dies from the mermaid kit. Joanna Sheen - Signature Dies 'Bubble Narrow Edger Dies SD484'. Creative Expressions 'Australian Collection - Background Die Set' by Sue Wilson. Spellbinders™ Nestabilities 'Labels One s4161' and 'Grand Dies - Labels One'. Creative dies 'Ornate frames DIOB0049'. Essentials/Adhesives: Gluedots. Double sided tape. 3D foam/mosegummi. High-Tack Double Sided Red Tape (Red Liner/Stix2/Miracle tape). Rangers Glossy accents, stickles. Hero Arts acetate. Techniques/Mediums: I used misc. Luminarte Twinkling H2o's Shimmering Watercolors, and Tim Holtz Distress Ink pads and Oxides, & markers to watercolor and distress image and papers. Hero Arts ink pad cubes. Signo white pigment ink pen.